Saya is an ordinary lethargic female high school student. At karaoke while she was singing enthusiastically a song of her favorite artist, Takase Kazuki, the person himself was watching her…!? 16 Life was published in French by Soleil from November 6, 2013 to January 8, 2014. I got bored one day and decided to read a random manga. This is how I came across 16 Life. The story was enjoyable and the plot was entertaining, but the girl was just too "typical shoujo drama queen" for me to be able to like or relate to. The main male character was amazing, like my favorite even when he became a douche-bag. He was hot, funny, and could sing. I loved the idea of "singing and rockstar centered" but I think it could've been done better and a little more drawn out and dramatic. Seriously, needed more drama!!!! Overall, I give this manga a 7/10, and I neither recommend this nor don't recommend this. Again, I only read it because I was bored. There's something a little comforting about love stories that fall together quite perfectly, even if they're too perfect to be realistic. 16 Life is good for people who still believe in romance that springs up from nowhere, musical talent that brings people to their knees, men and women that are prettier than average, and drama that could only come up in TV shows. I'll give you a glimpse. The protagonist, a girl who firmly believes that she should follow a straight path to a stable career, is scouted by a handsome music producer. Ooooh, what will happen next? What a surprise... EVERYONE knows what happens next. Despite how cute the whole situation may seem, the story is quite heavily laced with cliches. Love triangles abound, musical talent is guided by feelings, past relationships come back to light, etc. The brevity of the manga made me thankful because I was starting to roll my eyes over how sappy the love was. The characters were no help to the story, either. Saya is the typical heroine who lets herself be taken in by love from a dude she barely knows, and though she's friendly, her emotions can really get in the way of things. The only good aspect of that is that she can channel her feelings into her singing. That is really something considering the way feelings usually affect people's performances. I suppose the saving grace of the manga was the art. While big-eyed girls and good-looking dudes are not at all particularly original for shoujo, the artwork did fit the tone of the story. I think the mangaka's eye for clothing wasn't too bad, though I can't say much else about the rest. Another fatal flaw was the mangaka's total dismissal of a problem which was never resolved. I suppose in the epilogue it seemed as if it was done and over with or forgotten, but that dissatisfied me seeing that it seemed to be an important issue before. Otherwise, the story went on and that was that. So, should you read this? Only if you're into some super fluffy shoujo. I was rather impressed by the art and it looks ver cute and lovely ((even in the chibi form)) but the story is not that big of a romance all around type of story. It centers on Saya who as the protagosnist should go after her dreams and be a heroine.....well she doesn't do both at the beginning. Only after she meets Kazuki does she find her dream and begins to persue thantks to the help of him and his record company. The romance only brews many chapters later and it started as a convinience relationship. ((not so great for a person who wants romance all around.....yes Me)) but well once the story develops you can see them forming a bond and working together and it's very cute. Overall I thik this manga lacks of romance, the main character lacks of confidence, but I will give credit to the good art. if you're just looking for a simple romance and a story about a girl lacks of self confidence ((something many girls can resemble)) then this story is for you. 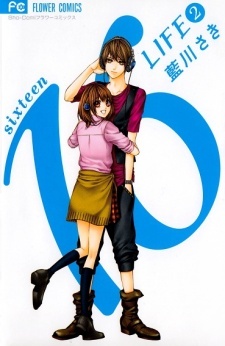 So I was updating my ps so I decided to read some shoujo mangas to kill time. The art is pretty cute . It showed what the character is supposed to feel on that scenario. Also I felt like some characters were really left out (well , it only has 2 vol sad ) . Well its Takase and Saya's story so what to expect .